where theta is the phase of each oscillator, omega is the natural frequency of each oscillator, N is the number of oscillators, and K is the coupling constant. Kuramoto found that there is a certain value of the coupling constant, KC, above which synchronization can occur, and below which it cannot. For any distribution of the natural frequencies of the oscillators, he was able to calculate KC. For example, for a Lorentzian distribution of natural frequencies, KC is just equal to the full width at half-max of the Lorentzian curve. For other distributions, the formula for KC is more complex, but we can still calculate it. In our simulations, we often used a Lorentzian for the distribution of the oscillators' natural frequencies. 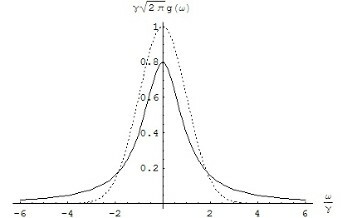 Here a Lorentzian distribution is shown as a solid line, with a Gaussian distribution as a dotted line for comparison.